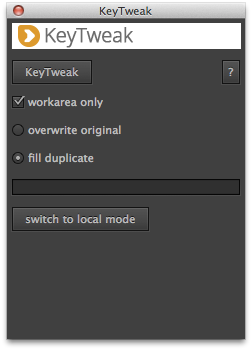 With KeyTweaks local mode, you can modify all keyframes of a property within the workarea. With the convenient arrow buttons, you can move the keyframes accurately in any direction. And you can even fade your changes smoothly in and out over time. The global mode is where the real magic happens: You work with a copy of your property that has much less keyframes than the original. KeyTweak transfers all your changes back to the original - and preserves the details hidden in the many keyframes of the original. The local mode of KeyTweak works with masks, but also with positions of 2D layers or other 2D position data like track points. In addition, the global mode even supports any other 1D, 2D, and 3D keyframes. 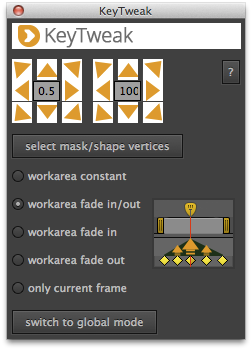 KeyTweak […] achieves the seemingly impossible: Edit a keyframed mask globally simply by points on one or two mask keyframes, and the rest are automagically changed 'accordingly'. Wow this maybe the most productive After Effects script I've come across!! Adobe should pay you for it, and integrate it as a stand feature!